Welcome to the Home Page of our Website! Courtesy of the links to the left, you can read all about the Park, the 'Friends' group, and find details of the events organised by the 'Friends' in collaboration with the Park Ranger. 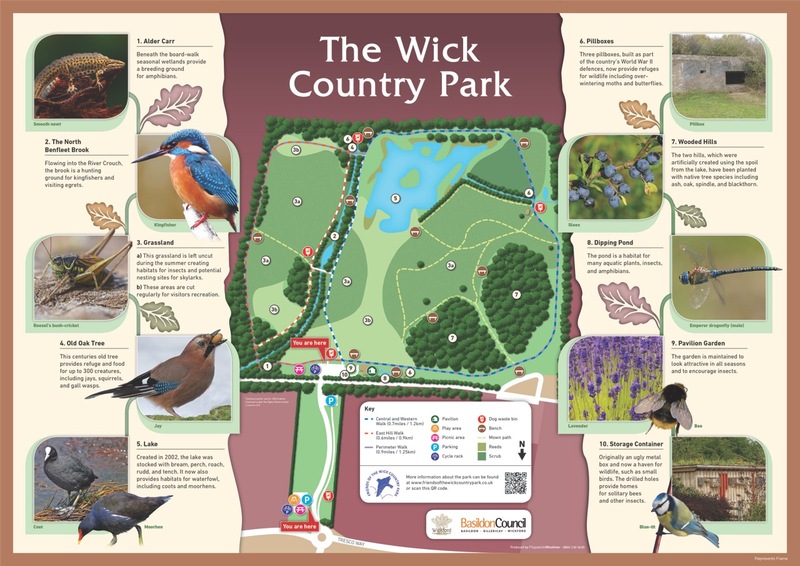 Through the 'Wick Country Park' link you will find directions and a map of the Park, and you can find notes about the history and development of the Park, the management of the Park, the children's play area, the park's plants and animals, fishing in the lake, and much, much more. 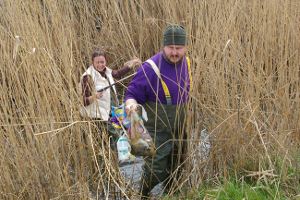 Other links will take you to details about the volunteer group - The Friends of the Wick Country Park - who we are, why we are, what we do, and how you can join us. You can also find full details about all the events we organise, most of which are absolutely free! Please browse through all our our website - there is a mass of information about the Park itself, and the events at the Park. The scope and range of this website has increased a lot since the beginning of 2015, so if there is something specific you are interested in, but cannot find, please use the 'search this site' link at the top of the list to the left. Type in any word or phrase and see what it alerts you to! 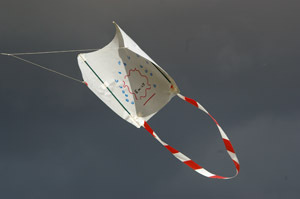 If you are interested in events and projects at the Park over the past years, have you visited our 'Skylarks Archive' ? (updated Monday, 04-Mar-2019 16:08:19 GMT). 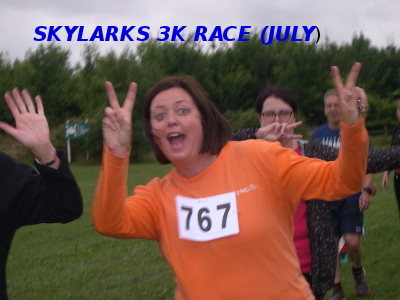 The Skylarks is our quarterly newsletter, and is issued in February, May, August, and November each year. Some great news!!!! There will be no charge to register your email address with the membership secretary, so that you can be kept up-to-date about events and other developments at the Park. Please see our membership page for more details. If you have a smart-phone when you visit the Park, you can now carry a map with you - please click or touch here to see the map and the accompanying notes. Our most recent Skylarks Run, organised by the Pitsea Running Club, was held on Wednesday 17th April 2019. Once again, the event was very successful. 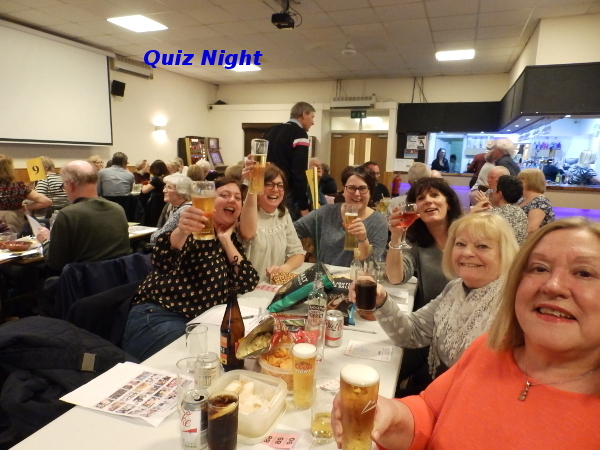 Results and pictures from the evening are available through this link (updated Tuesday, 23-Apr-2019 21:58:21 BST). 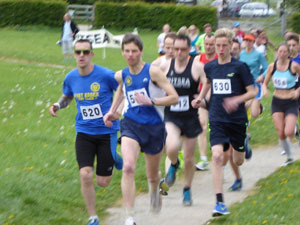 The results for the event held on April 17th 2019 can be viewed here. The results for the previous event, held on July 18th 2018, can be viewed here. Our first event of 2019 was the combined 'January Jaunt' / AGM on January 20th. Follow this link for some pictures from the day. 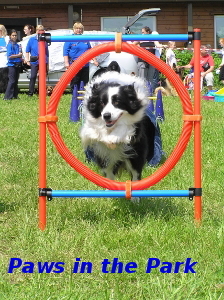 A report and photogallery on another successful event is in preparation. For further details, please click here (updated Thursday, 27-Sep-2018 16:57:29 BST). 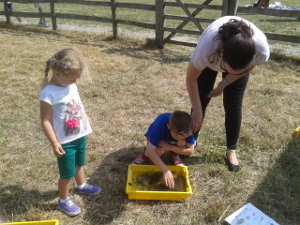 More than 55 children, along with their parents / grandparents, came along to enjoy our latest opportunity for children to explore some of the nature of the Park on Sunday 22nd July 2018. A report, including some pictures from the event, is now available - please click here (updated Tuesday, 07-Aug-2018 09:15:32 BST). Our Programme of Events for 2019 has now been completed. Please click on the 'Events calendar' link to the left for the full programme. We have two events lined up for April. 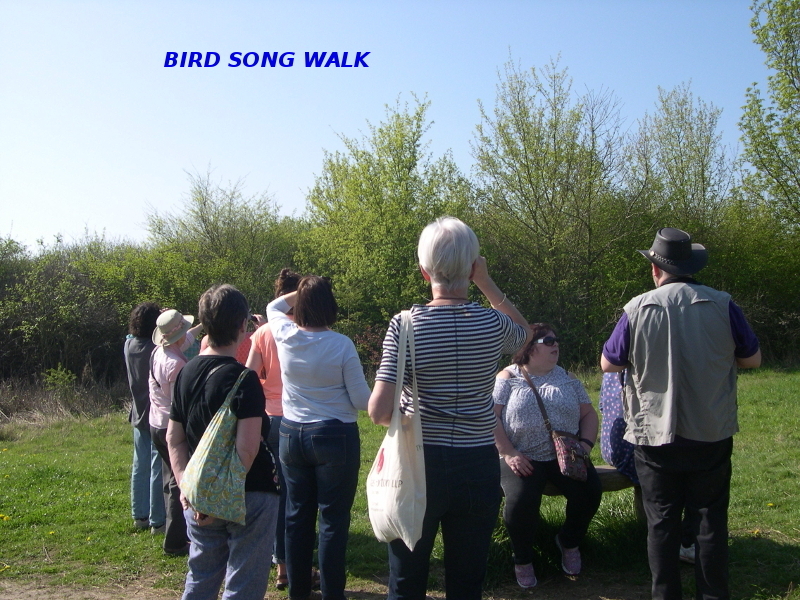 On Sunday April 28th at 10.00 we will hold the Birdsong Walk. Come and enjoy a stroll around the Park, under the guidance of the Park Ranger, Mark, listening out for bird songs and seeing which species we can spot. 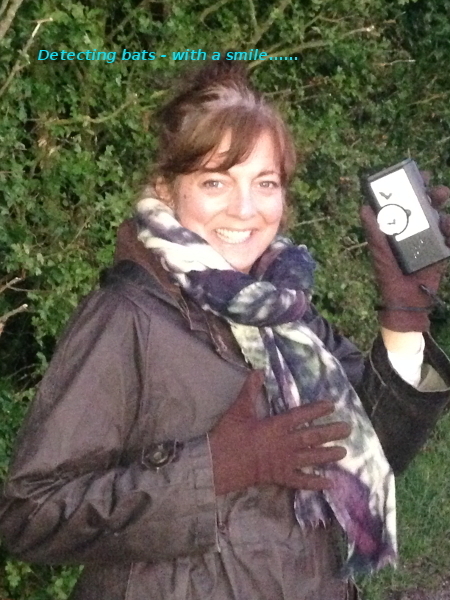 Typically, we record 20 - 30 different species during these walks. Details: this link. If you can't wait until our next event to get involved, why not pop along to help out at one of our 'Wick Weeders' sessions? The Wick Weeders is a 'group within a group' - some of the 'Friends' come together for a few hours up to twice a month - typical on the second and fourth Mondays - specifically with the intention of keeping the garden around the Park's Pavilion looking neat and tidy throughout the year, whilst being mindful of the need to ensure that it remains 'wildlife friendly'. 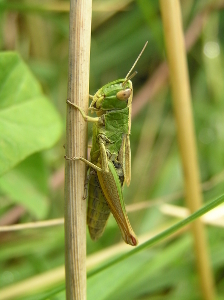 Please see the 'Wick Weeders' page for more details, including confirmation of the up and coming dates. We are always happy to welcome new members to the group! The first date for 2019 is Monday15th April. 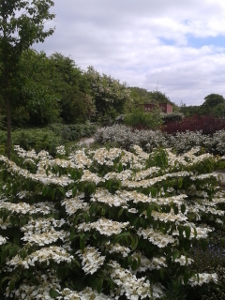 There will be plenty to do in the garden so if you want to get some light exercise and fresh air why not come along. Meet outside the Pavilion at 1.30pm. Tools are provided but you may want to bring your own gardening gloves. Drinks and biscuits are provided. Please see the 'Contact Us' link to the left for current details. We now have just one valid e-mail address, which is contact_us@friendsofthewickcountrypark.co.uk. The new GDPR regulations, effective from May 25th 2018, require us to make a 'Data Policy' statement available to all of our members. Please click here to access the policy. Please see the 'Why not Join us?' link to the left for details about membership. The chair's annual reports for 2018 and 2017 are available via these links: 2018 and 2017. In this day and age we should all be "doing our bit" to avoid damaging the planet by generating unneccesary 'land-fill' items. If you have an item that you no longer need have you thought about using one of the Recycling services, such as TrashNothing? Anything such as no longer needed furniture, equipment, toys, books, etc may be snapped up and given a new lease of life / home by someone else. Visit the referenced website for more details. The latest edition (number 56) of Skylarks has been sent to subscribed members of FoWCP; it will be available to the general public via the 'On-line Archive' link to the left, in June 2018, when our next issue is due to be sent out to members. If you would like to see your copy as soon as it is published, then why not register as a member of the FoWCP? Click HERE to visit the Membership page. 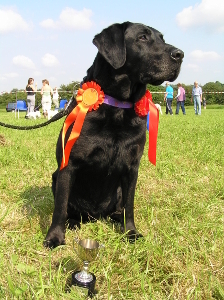 A very successful walk was held on April 8th 2018. A photo gallery is available here [updated on Sunday, 17-Feb-2019 11:25:59 GMT ]. 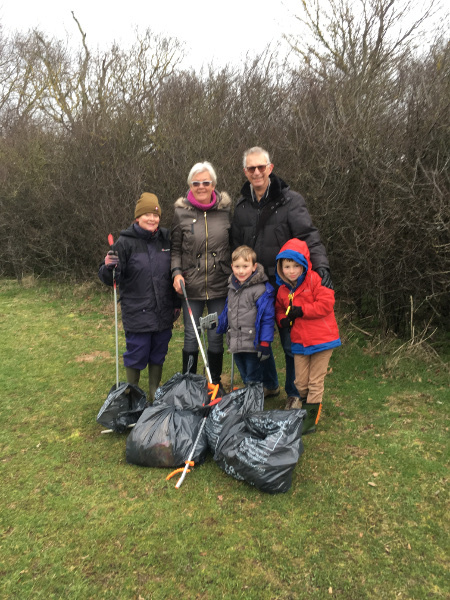 There was a 'litter blitz' at the Wick Country Park on Tuesday, February 13th 2018, as a result of which bags and bags of rubbish were collected. We would like to thank those individuals who baraved the very cold, albeit sunny, day and kindly gave up their time in the interests of improveing the environment for all visitors and wildlife. 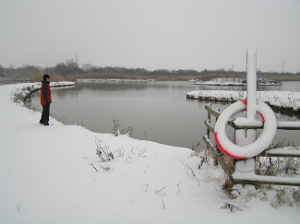 The worst locations were the children's playground area, the margins of the lake, the area near the pillbox, and in the hedgerows around the perimeter of the Park. 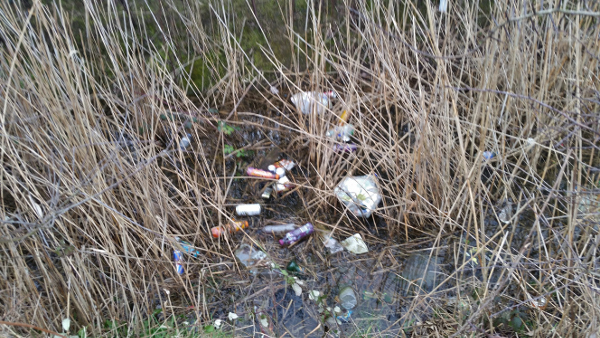 Most visitors to the Park do as we all would hope they would do - take any rubbish or recycling generated while visiting the park back home with them and disposed of properly. 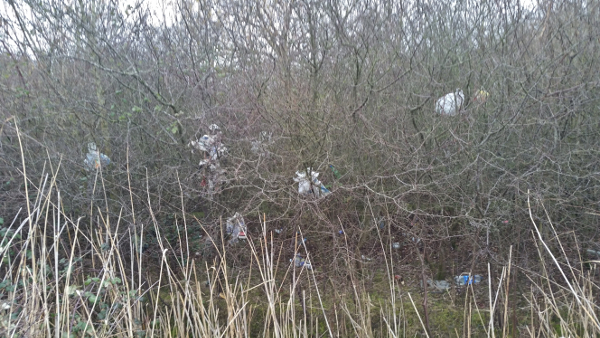 It is a tiny minority of extremely thoughtless and lazy individuals who spoil the Park for everyone else. 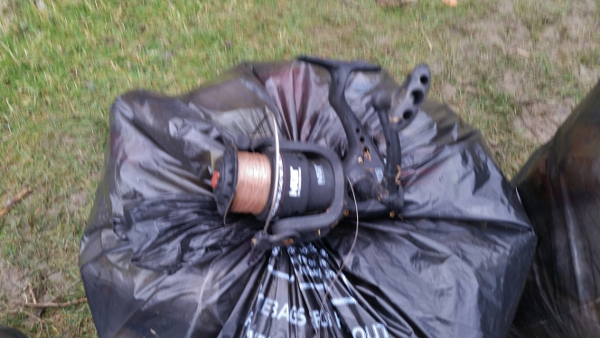 These pictures show the scale of the problem: bottles in the lake, rubbish thrown in the bushes - and even a discarded fishing reel! Why oh why are a small number of people so thoughtless, lazy, and inconsiderate? 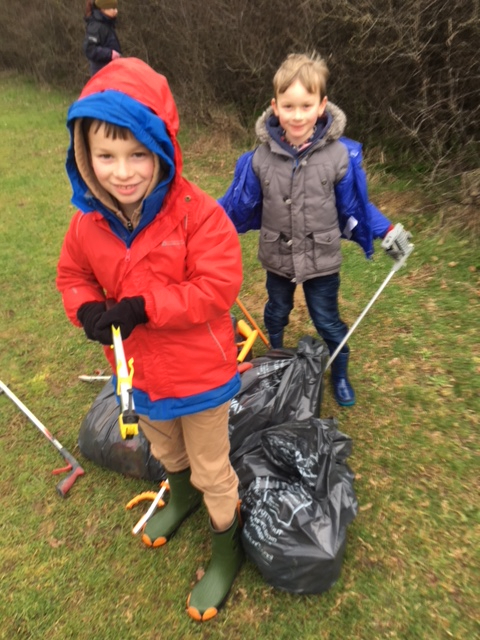 Here are our youngest - and also less young - helpers with some of the bags of rubbish collected. Why volunteer as a committee member? 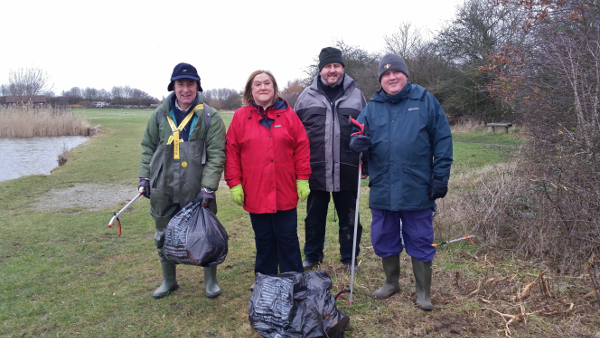 The work parties - most notably the 'Wick Weeders', but also regular litter-picking / cleaning sessions and occasional planting sessions - help to keep the Park 'spick and span' and provide enjoyment for all visitors. The visitors would certainly enjoy their experience much less if these maintenance tasks weren't done! Yes, running the events can be exhausting - though at the same time, huge fun. The key is, of course, careful planning, and with that aim in mind, we have developed a check-list with respect to each of the events so that when the need arises to 'pass the baton', there is the cumulation of 15 years of experience fully recorded. And, as we always try to freshen the events each year, there is plenty of scope for creativity and new ideas. Please click on the link to the left ("Directions to the WCP"). IMPORTANT: please note that if you are relying on your satellite navigation system to get you there, please set the destination to postcode SS12 9GP, which will take you to a point in Tresco Way, Wickford, close to the roundabout at the Public Entrance to the Park. Left to their own devices, some navigation systems will otherwise direct you to a private farm track, which, though it does cut through the Park, unfortunately, it by-passes the public carpark and leaves you stranded between two locked gates!!!! Please click on the picture links below, which will take you to reports and pictures from the various events listed. The Friends like to keep in touch with members and with other visitors to the Park through a variety of means, including email, and, of course, Social Media. Links to our active Social Media routes can be found at the foot of the list of links to the left of this page. Our FaceBook Page is now under new management, and if you are a FaceBook user, please check it out and use it to air your views and comments. For some while, we have been very active on the Wickford Streetlife service. As past users of that service will know, Streetlife closed on February 21st 2017, and users were encouraged to move their registration to a different service called Nextdoor. Anyone who has viewed the local Nextdoor message streams will be aware that many ex-Streetlife members perceived significant issues with it. For that reason, though The Friends do have a presences on Nextdoor, we also make use of an alternative service called Kahuti. You can find links to both Kahuti and Nextdoor towards the foot of the list of links to the left. We look forward to seeing you share thoughts about the Wick Country Park and the events that we organise through any of our Social Media outlets. If you enjoy the Park and enjoy the events that the Committee arranges, have you thought about helping us out to ensure that our events keep going into the future? We are always on the look-out for additional helpers, maybe to help with the running of a specific event, or to join our 'Wick Weeders' Group, or even to join our committee. Please see either the 'Contact Us' or 'About the Friends of the Wick Country Park' links if you think you could contribute. NO PREVIOUS EXPERIENCE NECESSARY!!! If your arm is feeling ever-so-slightly twisted, please contact Marie on contact_us@friendsofthewickcountrypark.co.uk. Not only will we, the committee members, be grateful, so will all the other people who visit and enjoy the Park and our activities!!! Do you feel that slight twisting of your arm.....? 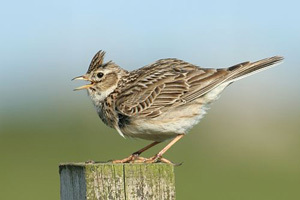 There are many references to skylarks on this website - for a start, our logo is based on this irresistible and intriguing bird, and it is also provides the title of our quarterly newsletter. Sadly, the number of skylarks seen flying over the Park in recent years has greatly declined - but rest assured that plans are being formulated to attract them back again! Please see the aerial video of the Park! In February 2016, Keith Savill, having got the appropriate permissions, kindly took a second video of the Park. Please see the link in the list to the left! 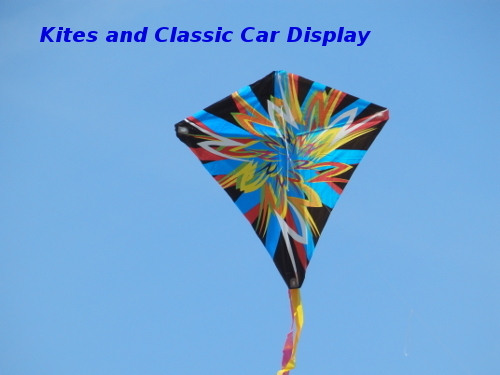 These pictures feature, left to right, top to bottom: a skylark, runners in one of our 3K 'Skylarks' races, a view of the lake in winter, a kite made at one of our Kite Festivals flying high over the Park, the Park Ranger and a 'Friend' undertaking the unenviable job of removing litter from the margins of the lake (just why DO that tiny irresponsible minority of people throw the stuff in? 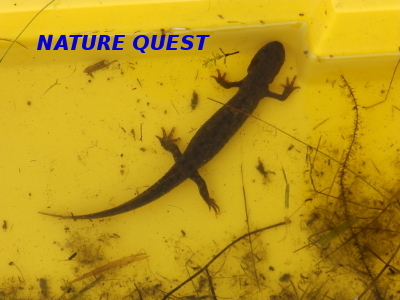 ), some children analysing their catch from the Dipping Pond at Nature Quest, a champion dog from 'Paws in the Park', the Pavilion Gardens in early summer, and a Grasshopper that was captured (and released of course!) at a 'Crickets and Dragonflies' event.